Weld County, CO (21 May)--One hundred days after our last update, Miss Debbie remains where animals belong: CAGED. BEHIND. BARS! It appears that Debbie has FINALLY encountered judges who are wise to her "get bail, skip bail, stalk/harass/threaten victims" routine. On Apr. 12, Miss Debbie attempted to get bond in the criminal charges she's presently facing. A judge levied a $10,000 bond on her newest charges ... but then DENIED bond on her probation revocation charge. 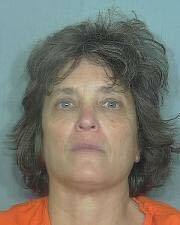 As a result, Miss Debbie remains behind bars at Weld County Jail in Colorado. Miss Debbie next faces teh court this Thursday, 31 May.